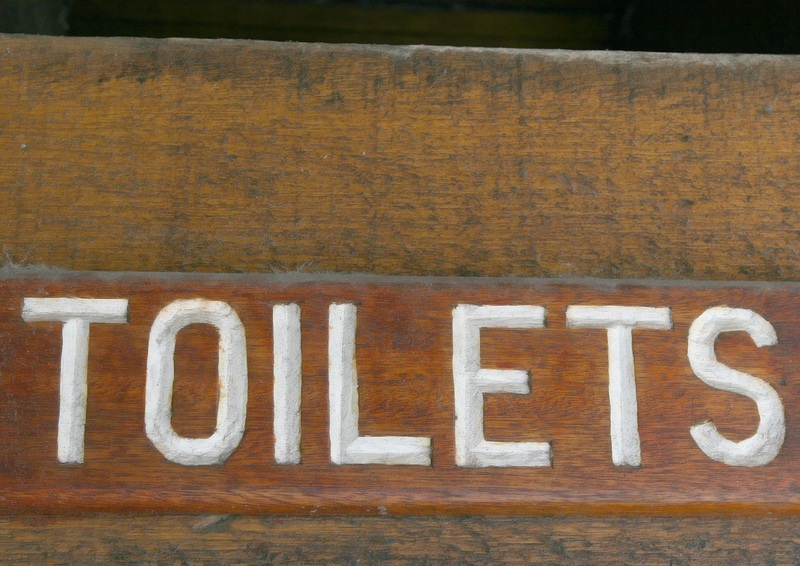 A toilet is a vital part of our modern-day society and everyone’s home has at least one. 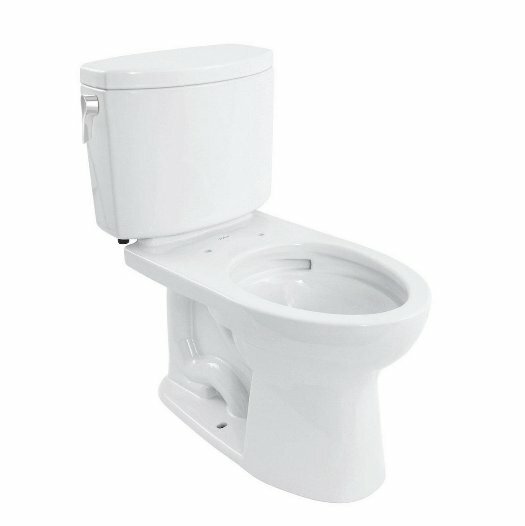 However, there are many different styles of toilet, such as back to wall, close coupled, high level, low level and wall hung. 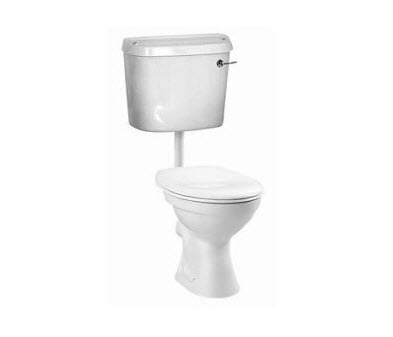 Probably the most commonly found in the UK style of toilet, the close couple toilet consists of a water cistern (sometimes called the closet or tank) that sits directly on top of the toilet pan. The pan is fixed to the floor and the cistern is fixed to the wall. Depending on the toilet design, the cistern may be short and wide, or tall and narrow, and operated by a lever to the front or side of the cistern or push-button on the top. A back to wall pan fits tight up to a stud wall or furniture unit, whilst the cistern is concealed within the unit or boxed in the wall. 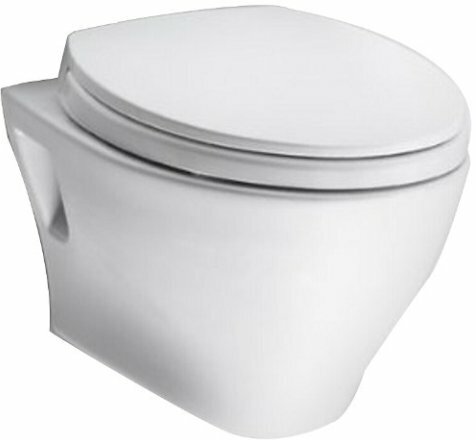 The flush is operated by a lever to the front or by a push-button on the top, and the cistern is connected to the pan by a short flush-pipe. There is usually some kind of access panel included with furniture units so that you can get to the cistern if you spring a leak. A high level toilet is probably the most traditional looking toilet available. It consists of a cistern mounted high on the wall, which is connected to the pan by a long flush-pipe. 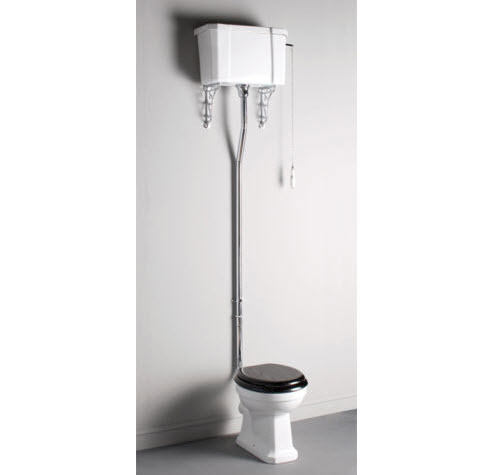 The powerful flush is operated by a pull-chain and handle. 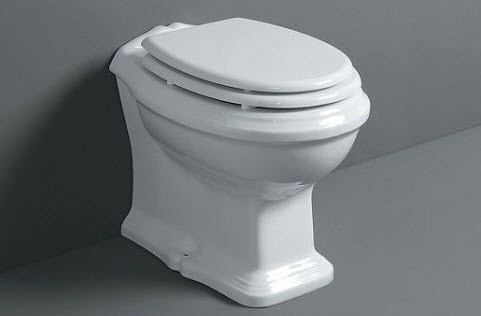 A low level toilet is where the cistern is fixed to the wall above the toilet pan and is connected by a short flush-pipe. The cistern is most likely operated by a lever on the front of the cistern, and the flush will probably be more aggressive than that in a close-coupled toilet because of the extra height of the cistern and the help that gravity gives. A wall hung toilet, hanging or suspended toilet, is fixed tight up to the wall but does not reach to the floor, which makes it very easy to clean underneath. A cistern concealed within the unit or wall connects to the pan by a short flush pipe and may be operated by a lever to the front, or a push-button to the top. To make the pan solid and stable, a steel support frame hidden within a furniture unit or boxed within a false or stud wall must be used. This also allows for a certain amount of flexibility in the height at which the pan is set. Check out the buyer’s guide for tips on choosing the right toilet for your bathroom.